Not far above, glides a cold, grey October sky. There is a brittle wind from the northeast and things are a little tense. Around the corner lies the Corryvreckan. I’m not sure what to expect, there’s not much swell today, but you never just know. The tide timings can vary, and the wind makes a difference from day to day – it’s not a place to take for granted. However, all goes well today, the plan is good and I’ve arrived at the correct time. There are a few boils and a bit of white here and there, but nothing that can’t be avoided. Game on. On paper I’m here to paddle a record attempt around Scarba. It’s not too far around, 10 miles or so, less of a record really and more of a time-trial. 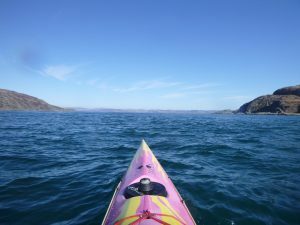 A little more of a challenge than your average TT though, as the route passes through the Corryvreckan and the smaller tide race of the Grey Dogs. 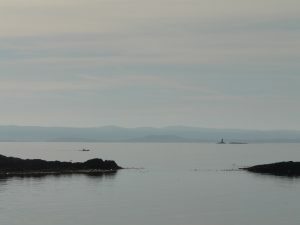 The small, lumpy isle of Scarba is separated from the north end of the island of Jura by the narrow stretch of confused water, known as the Corryvreckan. And that’s the real reason I’m here, to take a recce run through the Corryvreckan. 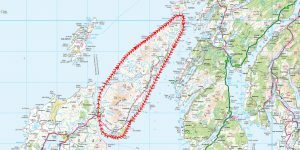 There’s a plan afoot you see – to return here in a few months time to make a record attempt around the larger island of Jura. 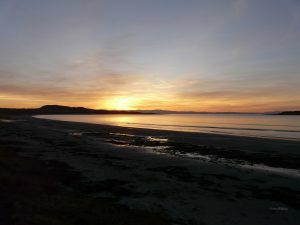 The island of Jura lies in the Inner Hebrides, off the west coast of Scotland. It is a long, narrow island – 26 miles long and 6 miles wide. 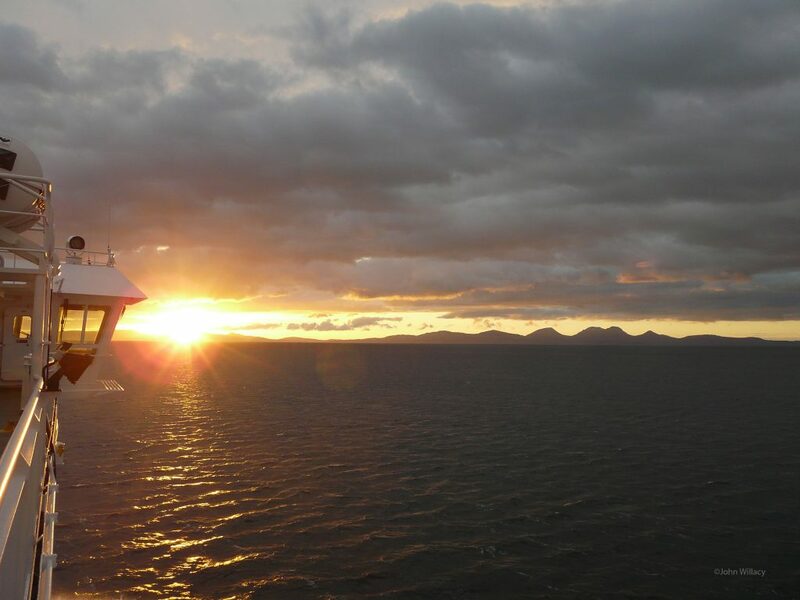 It’s a peaceful, though quite remote place; it takes a two-ferry trip to get there. On the island, there is only one road, which runs about 2/3rd the length of the east coast before turning into a track. If you want to see the other side of the island you have to walk, across country. As the population totals around 200 people, I guess there’s no real need for a motorway. 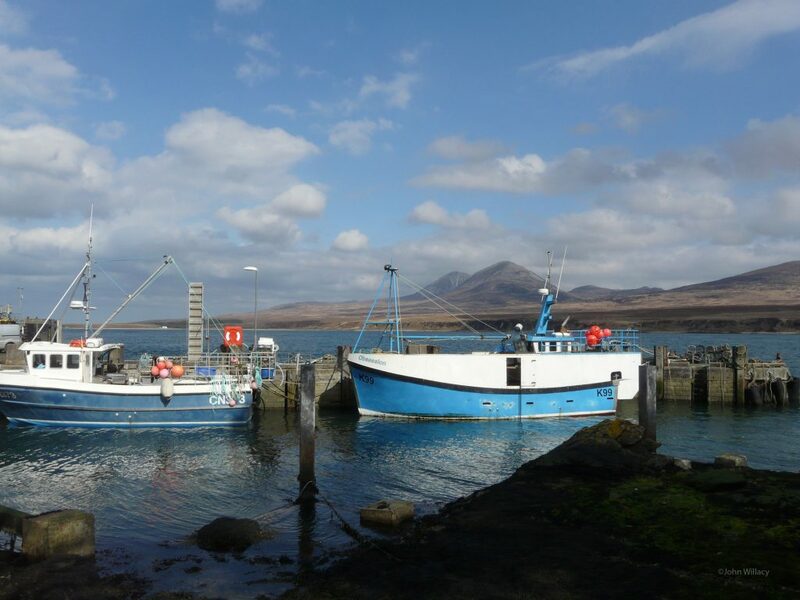 Jura has a pleasant hotel, a world famous distillery and three steep, rocky hills known as the Paps of Jura – the venue for a classic fell race, and plenty of nice views. Oh, and George Orwell once lived here too. 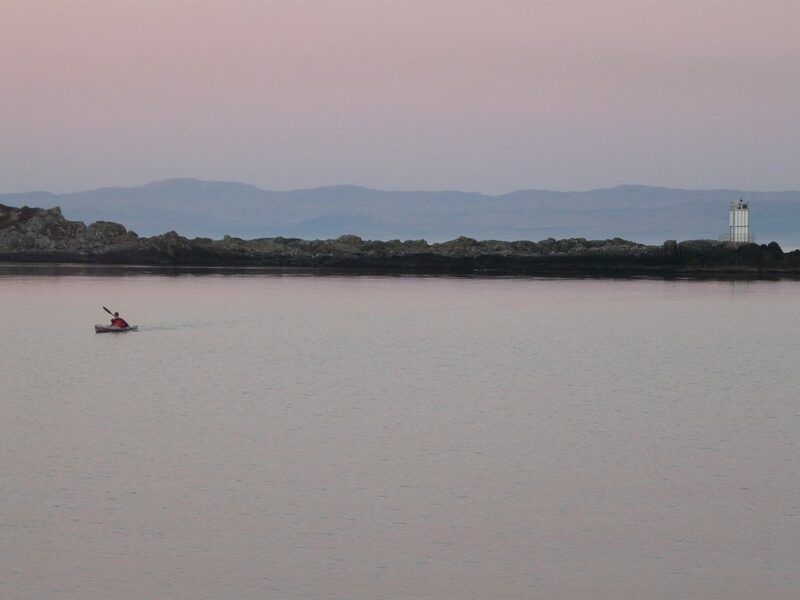 From the point of view of the performance sea paddler Jura ticks boxes on the list of a challenging circumnavigation – fast tides, exposed and remote paddling and a couple of crux-points – the Corryvreckan at one end and the fast-flowing Sound of Islay at the other. Once again, good planning is the key to achieving a good time. At just over 60 miles around, it fits nicely into the one-day record category. Another one of God’s island designs with the fast-paddler in mind. So how do we go about it then? Turn up with a good plan, good training and good weather. 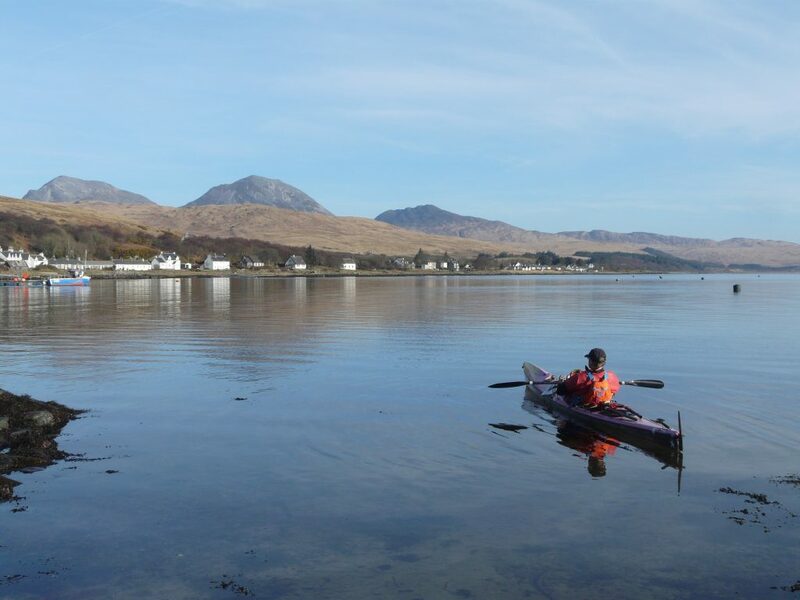 Paddle hard, have a break, head home. But of course there’s a little more in the detail. We start with a mini-plan, a sort of feasibility study really. No great detail here, just a quick look to see how far it is and to work out roughly how long it will take. Now is a time to see if the whole thing is even on in the first place. Normal training goes on year round, to keep a certain level of fitness. 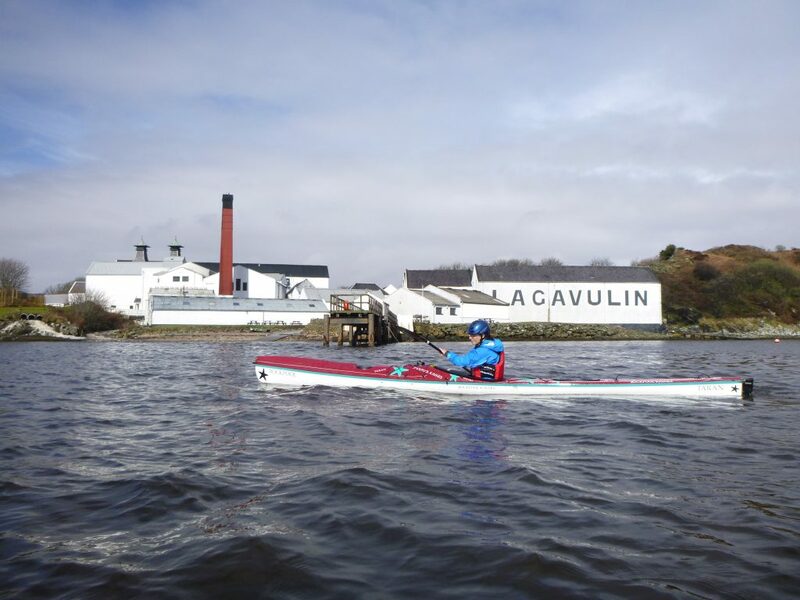 So once the mini-plan is in place, and we have an idea of how long the day will be, the training programme can be tweaked to match the estimated time required in the boat on the day. This is also a time to take a quick look at the tides and daylight hours, to see what time of year the whole affair is likely to happen. In turn this gives an idea of how long there is left to prepare. A quick count-back tells how many miles need to be added in each training block to the current training distance. Long term the weather may be watched, a little research done, looking for patterns, trends and local anomalies. This may also affect the time of year that everything takes place. Meanwhile there is no hurry with the detailed plan. For me I start to firm-up the details long before, but I’m not too keen on sitting down and doing it in one go. Instead, I prefer to work it over a time, with gaps between. This way the plan evolves; returning periodically helps it to steadily form a picture in my head. The first planning stage is to look for the crux-point(s). These are areas that have to be paddled through at specific times in order to gain passage at all, or to ensure that minimal time is lost. We are also looking to time things to minimise any dodginess in the area. If there is more than one crux-point on the route then it is a case of prioritising the most significant. A long list of juicy start-points can quickly reduce to a short list of sort-of-if-I-really-have-to locations as the plan develops. In this case the chosen Jura start-point did have toilets, however it was also 36 miles away from the Corryvreckan. 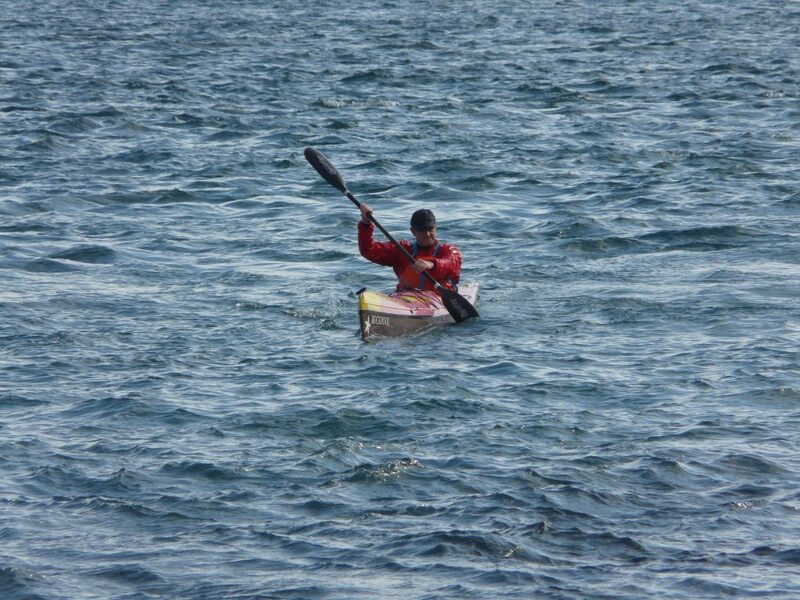 To make the 20 min tidal window after 36 miles of paddling was going to be rather exacting. 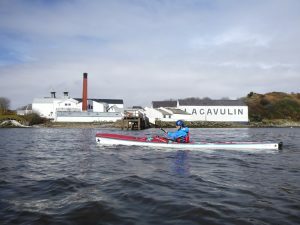 The lack of road access meant closer options would mean a paddle in (and out) to the start, with an overnight stay on the beach. A lot of faff before a record – so the distant start-point was chosen as the lesser evil. Now comes the slog part of the planning. 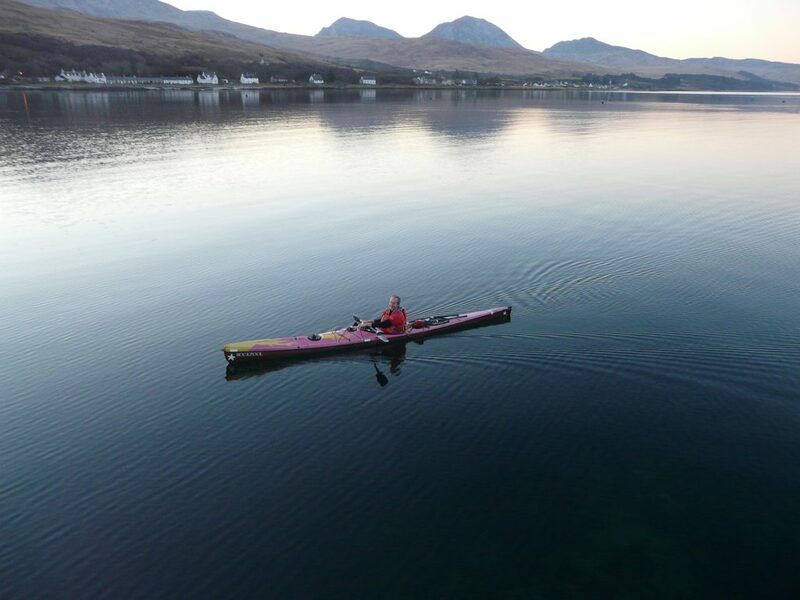 From the start-point (or working backwards from the crux-point) we work out the distance covered for each one hour leg – estimated paddling speed plus tidal assistance. Repeat this for each one-hour leg of the route. If it works, move the start-time one hour later and repeat the process to see if it is faster or slower (and if it still makes the crux timings of course). Repeat these iterations until either the time-taken increases too much or the crux isn’t met. Now repeat for the hours the other side of the original start-time. Now continue working out the time taken for each of the remaining one hour legs around the rest of the island; once again looking for the optimum time. Often a good looking plan comes to a screeching halt (literally) when you run out of flow – it’s back to the drawing board, to start out with a new start-time or position. Bum. Still with me? Yawn. 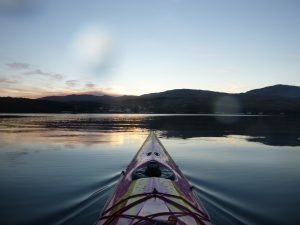 Once you have the optimum start-time for that start-point, it’s now time to repeat the whole process for paddling in the opposite direction. Oh yes. And then… it’s time to repeat the whole thing yet again, this time for any alternate start-points. Always looking for the fastest plan. Eventually a trend for an optimum start-time and position forms – mind numb, now is time to put your feet up and take a break. Thankfully the plan can take a bit of back-seat for a while and its back to the paddling. For the Jura record, the various iterations covered 24 sides of notes. A week or two later the plan is revisited and reviewed with fresh eyes. The double checking often finds mistakes unfortunately, though better found here than half-way around on the day. As the plan becomes familiar it starts to form a picture mentally too. It’s surprising how such a plan formed many miles away from an unknown area, can all seem familiar when the paddling finally arrives. If all is well it’s time to look at the tidal flows in more detail next and lay out all the GPS waypoints, trying to follow the fastest flow for the fastest route. 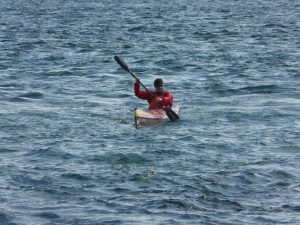 Paddling on the day will closely follow the GPS route laid down at this stage. Once the waypoints are finalised the planning sheet can be completed too. This laminated sheet sits on the spraydeck with bearings and distances for each leg. It also has arrival timings for each waypoint. On the day the aim is to paddle to these timings, arriving within a few minutes of each one hopefully. If not then either the paddling or the plan needs a re-tweak on the fly. While all this has been going on, the training continues of course. Time in the boat is important; mileages are patiently increased on the long-paddles. Training sessions predominately revolve around interval work or sub-hour continuous paddles though; too many long-miles can lead to fatigue rather than fitness gain. There’s also a technical component of course. 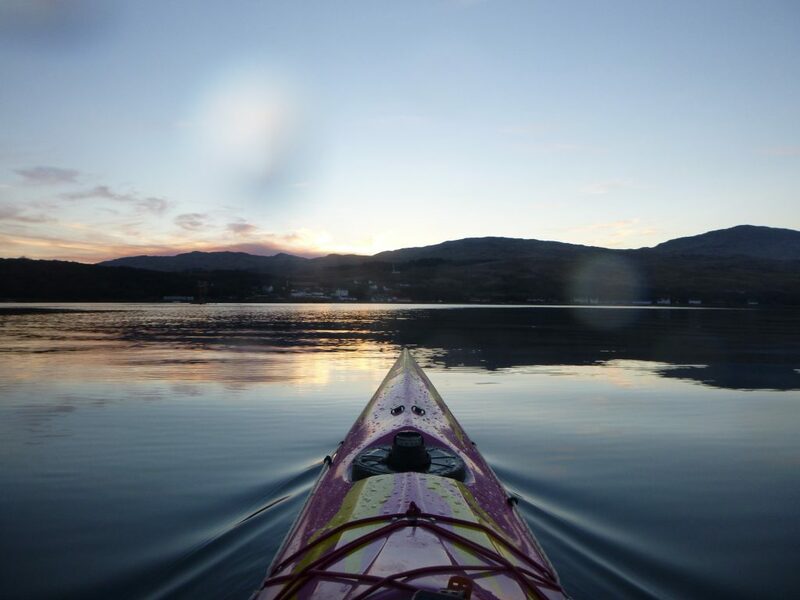 Skills need sharpening – self-rescues, nav, pacing, moving-water, windy paddling and so on. Along the way I like to use Progress Records, if they fit in the calendar. These are shorter attempts that are useful to check fitness and to allow a real-life opportunity for familiarisation with the long-distance paddling routine and kit. They also give a fitness benefit if timed correctly, and if the main goal for the year doesn’t happen then at least you can walk away from the season with something. If a progress record doesn’t fit in, then a long, local time-trial steps in to fill the familiarisation gap. It’s all for nought however if you don’t make the start line on time. 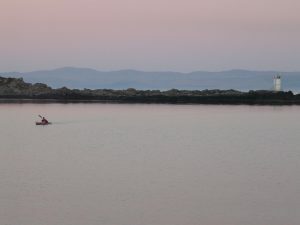 So, as is the way for any trip, the hum-drum stuff has to be considered too – ferry crossings, accommodation, holiday time and such, all have to be organised. Without all of this the attempt doesn’t happen anyway. The day finally arrives though. Shoulders have been worked, ferries have been sailed, maps have been learnt and the plan has been viewed, and re-viewed until it dribbles out of your ears. Now is time to get on with the job. We arrive and the forecast predicts a weather window later, though only of 2 days max. There’s no point setting out if you don’t have good weather, you are going to waste your time and a lot of effort. The Corryvreckan is not an easy place to take a look at; it doesn’t need much weather to make it an unpleasant spot to be either. So with a 36 mile lead-in I want the odds on my side as much as possible. Good weather and no-swell is the order of the day, I don’t want to be caught out at the top turn. So we hang around for a day or two, waiting for the weather. A few last-minute easy paddles and a little exploring fill the time and take the mind off things. I’d previously decided that a paddle-in and camp on the beach in the north, wasn’t for the best. So a night in the van sleeping on the water’s edge is the score instead. The beach faces east, half-way up the island. During the night we both awake to the sound of surf dumping on the beach. Coming from the Atlantic-west it must be big to make it through the gaps at the end of the island and all the way up to here! There isn’t much sleep. Eventually a chill, sunny morning breaks though, to reveal the boisterous surf is actually only a few inches high! As realisation dawns, the day is on. And so, down to the start-point at Craighouse. Perfect calm weather. Clocks started and away. All goes well initially, it’s time to get into a nice rhythm, to not start out too fast. Turning into the Sound of Islay I can see the flow is building nicely. 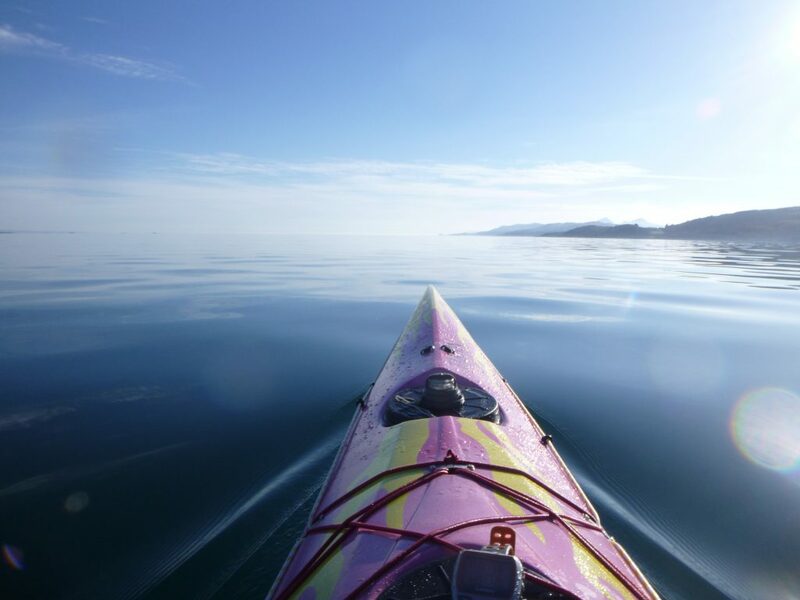 It’s a calm, clear day – just a slight haze in the distance, the faster water is easy to follow. Half-way down the sound I’m up on time, making a pleasing 9 knots, chasing the flow. 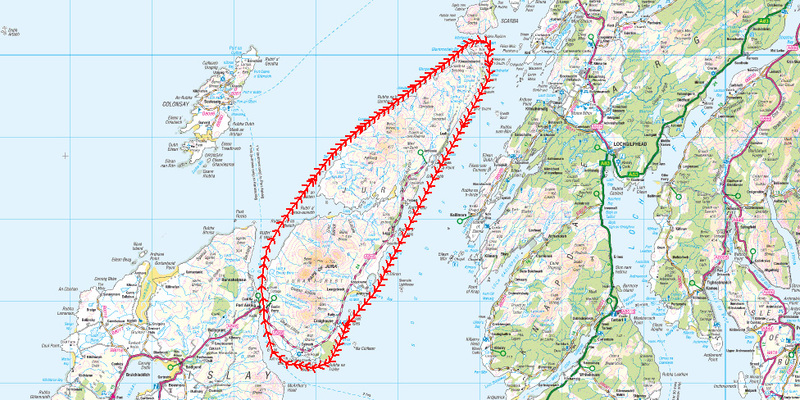 It’s better than being down, but I still don’t want to get to the Corryvreckan too early and have to sit around getting cold – that’s effort wasted too. Out of the sound, well up on time now, barren moorland and the grey lumps of the Paps rest over to the right-hand side. 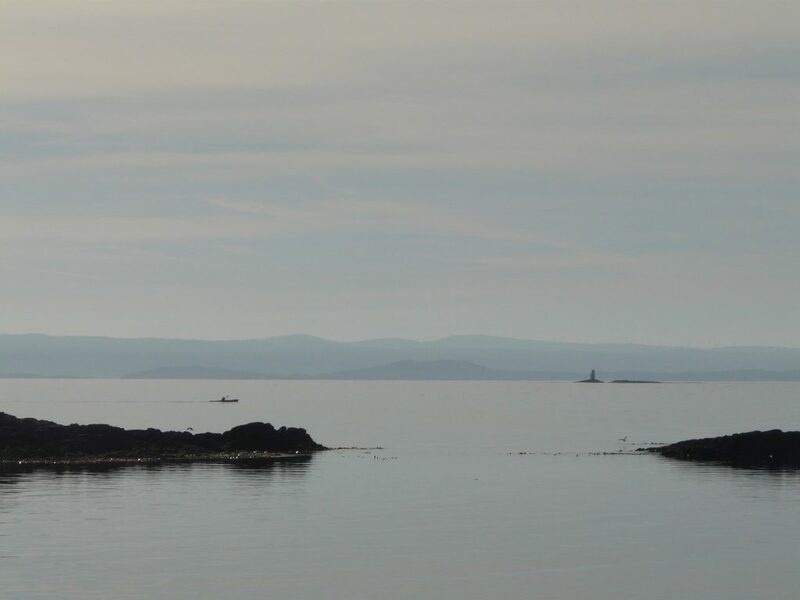 Ahead and to the north, Mull lies in the hazy distance. 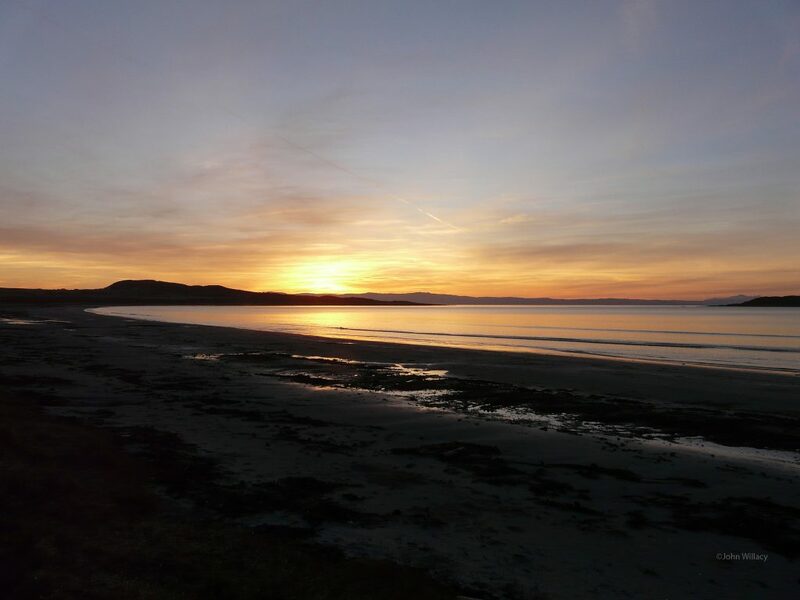 The smaller isle of Colonsay lies across to the west, a few miles out. Clearing the shelter of the sound brings a gentle swell from the north and west, a chill north breeze forms too. It’s not strong but it adds a little to the level of effort required and starts to cool my arms. Progressing north the swell increases, just enough to spoil the paddling rhythm. And as the sun rises higher over the hills, the breeze strengthens too, it starts to get a little cold. Four hours in and the wheels drop off. It’s not unexpected, but I was hoping to last a little longer. At the same time I decide I have to add a cag due to the chill, always a nervous moment pulling it over my head while alone on the water. It’s tighter than the last time I did this too… aah fatboy. Tidal data for this stretch was vague, and as I head towards the Corryvreckan I’d guessed on some assistance from an eddy towards the north. However its help arrives much further up the coast than I anticipated. Time is lost. While this is a little frustrating, the earlier gains through the speedy Sound of Islay cancel out the loss nicely and I close nervously on the Corryvreckan only a few minutes down. Good. The tide is not yet running through in the direction I need which is not so good, however it’s only a gentle flow against. There’s spikey water in the narrows, though the swell creeping around the edge of Scarba happily doesn’t make much of an impression. There’s a definite sense of relief as I make it through. 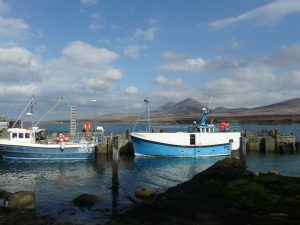 Once through and into the Sound of Jura the conditions are completely different, flat calm and no breeze. The sun feels warm again. Heading south now, I have to sneak in close to hunt for an eddy, the flow in the larger sound is vague and doesn’t appear to have turned yet. But this helps in a way, I find a good eddy and am soon making decent progress south. Fatigue is setting in now, it has been 8 hours on the go. The admin routine starts to fall apart, as I find any excuse to stop paddling. Dipping self-indulgently into the emergency food it’s time to man-up and get on with the job. A few confused calculations tempt me with a possible sub-10 hour finish. This concentrates the mind now and retrieves hidden reserves – pull hard fatboy. The tide has turned all along the Jura coastline now and the speed is steadily picking up. I’m pushing hard, the sub-10 goal keeps things focussed. There’s a minor moment of worry in the later stages, as I take a lazy line off a headland and find myself wallowing in a large eddy, watching the speed drop. Mental calculations sluggishly return a seemingly disastrous post 10-hour finish. Follow the flow fatboy. I can see the finish-line ahead and slightly right but counter-intuitively head out to find the faster water. The speed rises pleasingly once again, the 10-hour goal is back on-line. Now it’s a final-throes push to the line. Nothing left, the clock stops at 9hrs, 55 mins and 40 secs as I cross the line. I’m pleased to make it under the 10 hours, while the magic box shows 61 miles. I glide slowly back in, looking over, once again, to the silhouette of the Paps in the distance. At the scruffy beach I’m grateful to stand up once again, while I disentangle from boat and equipment. Kit is sorted, the boat loaded and hotel food consumed. The sun goes down. Job done – the plan worked.